The aim of this area of our site is to share with you the years of experience that our gardeners possess here at The Vyne situated in the wonderful countryside of Hampshire. We have on hand some 30 gardeners consisting of staff and volunteers many of whom have worked in the gardens for many years conserving and tending the varied areas of the property, it’s flora and fauna. The volunteers and staff all get a lot of pleasure and satisfaction from our discussions with visitors to our gardens who themselves aspire to learn more about their own gardens. It may be that you have a burning question about a particular plant or are having problems with a particularly veracious pest…don’t we all at some time during the growing season. What ever it may be we hope that our musings here will be a source of help and interest to you. We also hope you enjoy The Vyne gardens as much as we do working in them and that we can help you enjoy yours more. Please feel free to drop by and talk to our garden guides or post feedback or a question via the comments area on this page. Soil productivity is an important factor for us in the Walled garden. Green manuring is gaining popularity as a method that successfully improves soil structure and helps stop soil erosion. Green manuring involves growing a crop, that will be worked into the soil later. The addition of organic material improves soil tilth while the nutrients used in plant growth are conserved and returned to the soil. 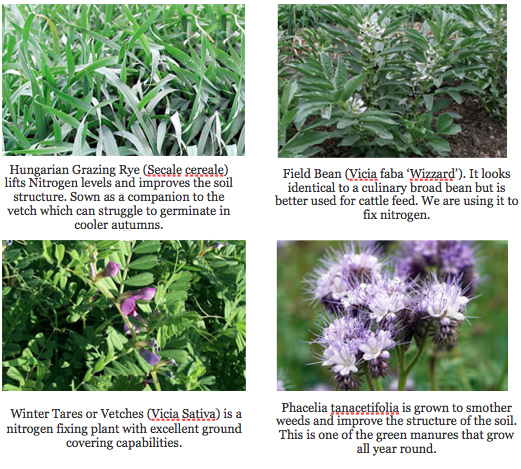 Almost any crop can be used for green manuring, but legumes are preferred because of their ability to fix nitrogen from the air. Green manuring with legumes (peas, clovers, lentils, etc.) is called legume green manuring. Allow the crop the grow for 8 weeks, if it flowers before this time, cut off any flowers and then simply work the plants into the soil. After this they will simply breakdown, releasing nutrients into the soil and encouraging healthy micro-organisms to flourish. French Marigold [scented varieties only] exude a substance which helps keep soil free of pest nematodes and deter whitefly when planted around tomatoes. For best results in terms of biological control the planting of marigold needs to be reasonably dense. Some studies have shown that even after the marigolds have died down they can still have lasting pest control effects sometimes after months or years. Marjoram as a companion plant often improves the flavour of vegetables – Sweet marjoram giving the best results. Comfrey. This plant accumulates calcium, potassium and phosphorous. It is an excellent compost activator, foliage spray when seeped in water for 4 to 6 weeks and highly beneficial when planted near fruit trees. Why are there no Tulips? This is our third year without Tulips in the annual borders as we fight to eradicate a fungal infection of the soil called Tulip Fire. (Botrytis tulipae). What have we planted instead? We are utilising this opportunity to further improve the structure and nutrient value of our bedding scheme by growing green manure in them instead. At the end of September (Several weeks earlier than normal) we removed the summer bedding plants to the compost heap. The soil was then lightly cultivated and the green manure sown. The seeds germinated through the milder autumn weeks to provide groundcover through the winter and a profusion of flowers in the spring. Just before they go to seed we will cut them down and thoroughly dig them in. What green manures are we growing here? In the two cross shaped borders you will see Field Beans and Phacelia tanacetifolia. In the centre circle you will see Winter Tares and or Hungarian grazing rye.